NEW PRODUCT!! SPECIAL INTRODUCTORY PRICE!! Set your table with Elegance!! Enjoy our new line of premium designed plastic plates and bowls complemented with our matching premium designed plastic tumblers and wine cups!! 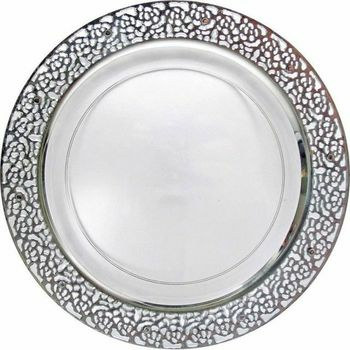 Inspiration 10 1/4" Clear w/ Silver Lace Border Banquet Plastic Plates 10ct. Inspiration 9" Clear w/ Silver Lace Border Luncheon Plastic Plates 10ct. Inspiration 7" Clear w/ Silver Lace Border Dessert / Cake Plastic Plates 10ct. Inspiration 12oz. Clear w/ Silver Lace Border Plastic Soup Bowls 10ct. Inspiration Clear w/ Silver Lace Border Serving Trays 2ct. Inspiration Clear w/ Silver Lace Border Serving Trays 20ct.